Why does one job always lead to another? 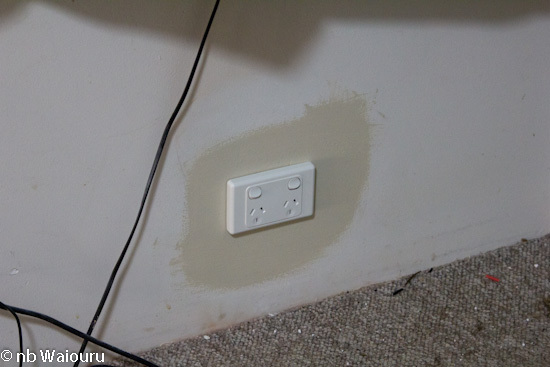 The new power socket in the bedroom has now been installed. The bedroom is going to be repainted in the near future so I took the opportunity to repaint around the socket with the new colour Jan has chosen. Next all the repair painting was done in the lounge. The channel in the wall is now invisible. 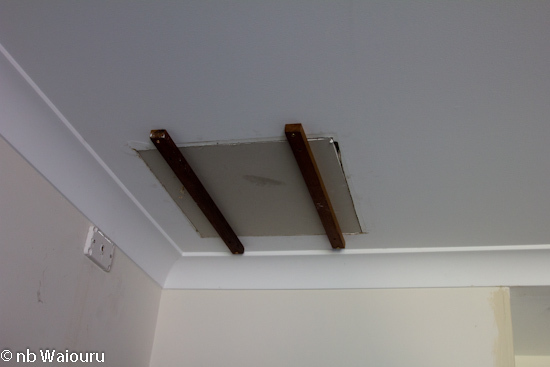 A piece of scrap plasterboard was cut to size for the ceiling hole created by the removal of the air conditioning duct. I used four smaller off cuts as bracing inside the roof. The patch was then glued to these and held in place with some temporary timber bracing. The glue will be set by tomorrow morning enabling me to remove the bracing and start plastering the joins. Jan cleaned all the walls and floor of plaster dust and we were about to start moving the recliner chairs back against the wall when we felt something was wrong with the first chair. 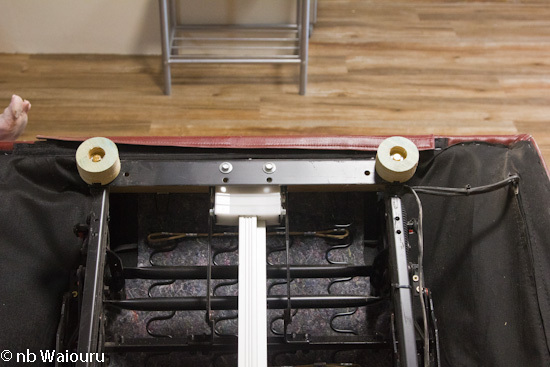 I rolled it over discovering the four flimsy plastic pads on the base had broken off leaving the weight of the chair to rest on the head of the bolt. 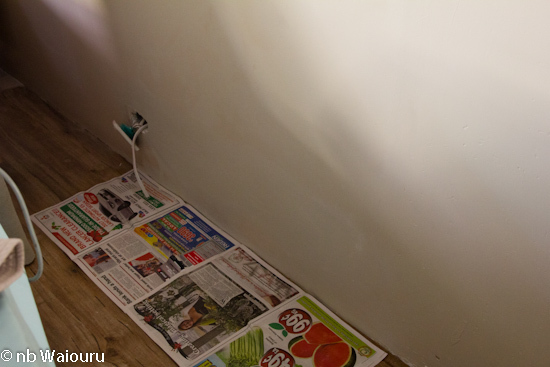 If we had left the chair like this there would have been some serious damage to the new timber floor. Both of us looked online for a solution without any success. OK, another job! I've made four new feet from an old scrap of 4x2 timber. The first step was to cut four round disks using the circular hole saw. Then I rebated one side of each disk so the head of the securing bolt would be countersunk. The expensive part were the bolts and washers ($8). Of course they were an odd size (7mm) because the chair was manufactured in China (what isn't these days?). 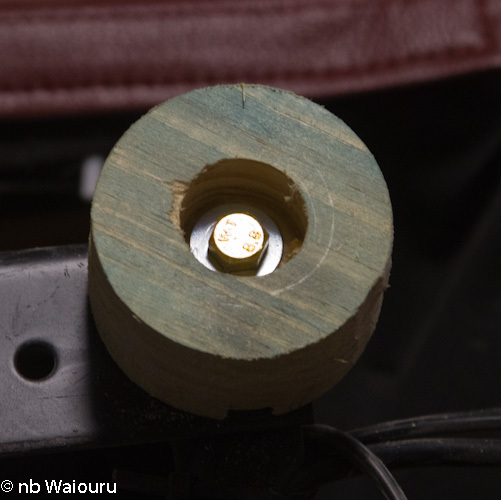 A washer on the base and under the head of the bolt to spread the load and prevent the timber from being crushed. A pad made from the bedroom carpet was then glued to each foot. Yes, we are going to replace the bedroom carpet! Once the carpet glue has set I'll cut off the surplus with the razor knife. Once we've confirmed the method is successful I'll do the second chair.